An unexpected windfall is usually a cause for joy—a winning lottery ticket perhaps, or a gift from a long-lost relative. For one Springfield man however, winning a motorcycle at a local restaurant opening led not to a joyous celebration, but to a run-in with a dangerous biker gang. According to the Springfield Shopper, Homer Simpson attended the recent grand opening of Greaser's Cafe in Springfield with his family. During the festivities, he and his wife Marge entered a dance contest and won. Grand prize was an all-original 1955 Harley-Davidson FL Panhead. Simpson, who was not a motorcyclist but was nonetheless tickled at winning the bike, immediately set to making the most of his good fortune. He quickly learned to ride with the help of his son, and took to bike life surprisingly well. The '55 Panhead that Simpson won. 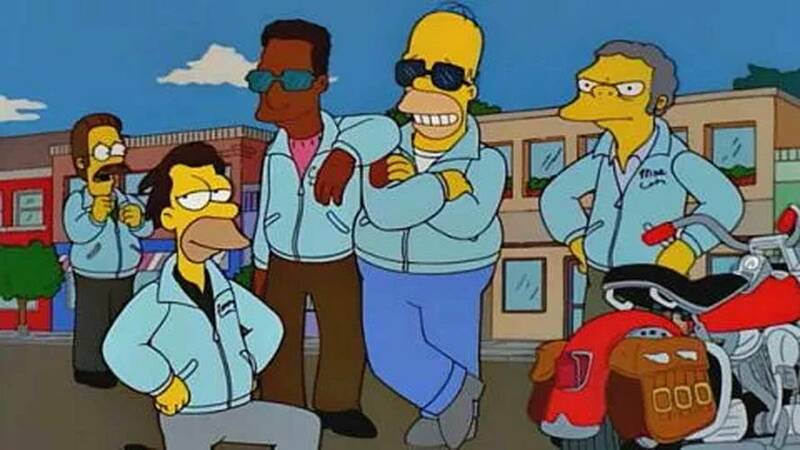 Not satisfied with riding alone, Simpson soon went all in and formed his own gang with some friends. Calling themselves the Hell's Satans—Simpson's apparently tongue-in-cheek reference to other, more famous biker gangs—the group began riding through Springfield together, tangling with local police, and generally making a nuisance of themselves. 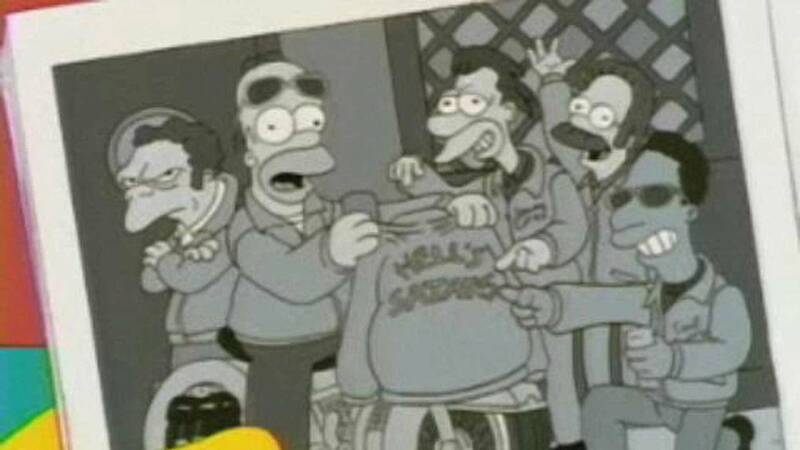 Simpson even went so far as to create a line of Hell's Satans merchandise—jackets, frisbees, pogs, etc. 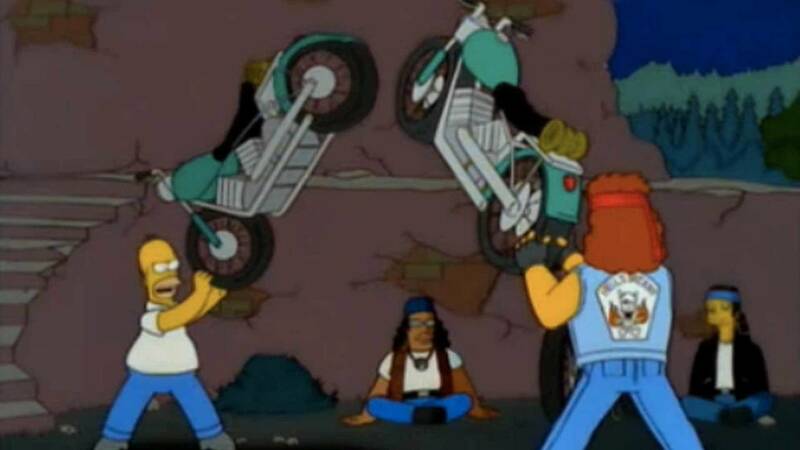 Too boost the gang's popularity, Simpson wrote an article about the Hell's Satans for a motorcycle publication. It was this ill-advised article that turned Simpson's life upside down. The Springfield Hell's Satans as they appeared in Simpson's magazine article. From left to right - M. Szyslak, H. Simpson, L.Leonard, N. Flanders, C. Carlson. 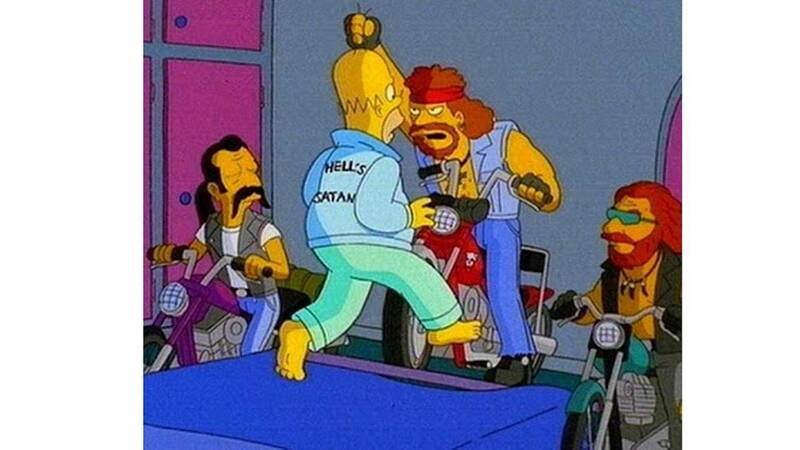 Unbeknownst to Simpson, there was a real one-percenter biker gang called the Hell's Satans. Thanks to the magazine article, the Satans chapter in nearby Bakersfield caught wind of Simpson's unsanctioned use of club colors. Like most motorcycle clubs, such as the Hell's Angels, Outlaws, Cossacks, Bandidos, etc., the Hell's Satans colors, logos, and other assorted imagery are trademarked. To protect their trademark, and to put the fear of God in the Springfield upstarts, Bakersfield Satans' president Meathook led a group of Satans to Springfield where they forced Simpson to eat everything bearing the Hells Satans logo, trashed the Simpson home, and kidnapped Simpson's wife Marge. The Bakersfield Hells Satans confront Homer Simpson over trademark infringement. This led to a cross-country chase with Simpson pursuing the Satans through various roadhouses and pestholes to retrieve his wife. Eventually, Simpson caught up with the Satans and, after a short but violent altercation, escaped with both his wife and his life. Simpson and Hell's Satans president Meathook duke it out over Simpson's Wife. 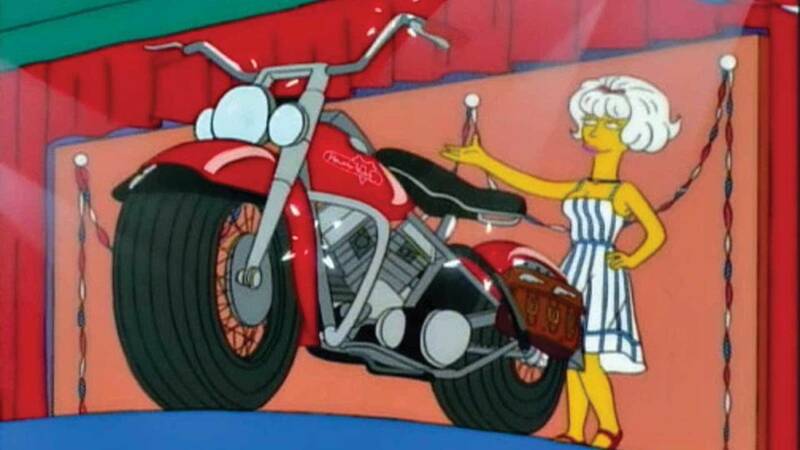 The Shopper reports that the Simpsons are now home safe and sound from their harrowing experience, and Homer plans to sell the bike and give up the life of a one-percenter.